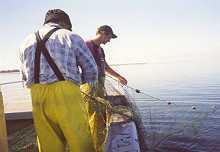 Do hooked fish survive well when released? Habitat suitability modelling - Identifying important fish habitat in coastal waters. Monitoring southern rock lobster larval settlement to access future catches. 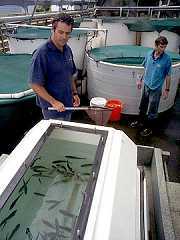 Fish aquaculture research tanks at PIRVic, Department of Primary Industries, Queenscliff. Photo courtesy MAFRI. a miniature data logger to a snapper.